I’ve recently been revisiting several blog posts and resources that I wrote in the last couple of years. My renewed focus on writing in math class is a result of reading several articles (Learning from Weblogs, Reducing Gender Achievement Gap, & Talkback Project) about blogging, digital learning, and teaching skillful teaching (current issue of Ed Leadership). These articles aren’t all about blogging but they are about components of high-quality learning opportunities and the direction these opportunities are going in with continued integration of more and more technology. With the recent release of the Digital Learning Now! white paper from the Foundation for Excellence in Education, there is a continued push for the power of online learning and alternative learning environments. The paper pushes for an increased focus on outcomes and demonstration of competencies and a decreased emphasis on seat time as a graduation requirement. These points seem to indicate a movement toward a different educational model, as well as a model that utilizes technology integrally. It is important that students are challenged early in their educational career to learn how to use technology effectively. The blogging articles were simple articles that just confirmed with some anecdotal and some empirical results that allowing students to write in an online environment has a positive impact on their learning. Miyake, 2010, found that even a short well designed blogging routine can have a positive impact on student learning. In the study, female physics majors that blogged about during the beginning of the semester closed the achievement gap with their male counterparts. The project explored values affirmation and had the biggest impact on females who tended to endorse the stereotype that males were better at physics than females. The simple act of writing about the stereotype helped students reduce the belief. Blogging wasn’t as important as being asked to write about the belief, but the publication and public nature of the writing is believed to have had an impact on the students. In Du and Wagner’s 2005 study, all students were asked to maintain weekly online learning logs, describing their past learning, articles read, own reflections, as well as opinions on learning logs kept by other course participants. Students who maintained the blog assignment performed significantly better than students who didn’t. Again, the blog isn’t necessarily the biggest issue here, but the cognitive constructivism and social constructivist approach that the assignment enable create powerful learning experiences. Requiring students to place their work under public scrutiny appears to better prepare them for a comprehensive final exam and overall course performance. In the Witte’s Talkback Project when administrators shut down the blog over safety concerns, a student wrote simply, “By taking away our access to the Talkback Project blog, you have taken away my voice.” It is this kind of engagement and connection that blogging can illicit for students, and why I am coming back to a practice that makes learning more accessible to students. As I read this article, I kept coming back to blogging. I didn’t blog when I was in school because it didn’t exist yet. The process may not be natural to many teachers, but there is more and more evidence that blogging has a positive impact on student learning from middle school to undergrad. Blogging is flexible, and is just as applicable to ninth grade literature as it is to calculus if the lessons are designed well and supported by good instruction. Kajder, S., Bull, G., &Van Noy, E. (2004). A space for “writing without writing”: Blogs in the language arts classroom. Learning and Leading With Technology, 31(6), 32-35. Loewenberg Ball, D., and Forzani, F. M., (2010). Teaching Skillful Teaching. Educational Leadership, 68(4), 40-45. Miyake, A., Kost-Smith, L.. E., Finkelstein, N. D., Pollock, S. J., Cohen, G. L., and Ito, T. A., (2010). Reducing the gender gap in college sciences: a classroom study of values affirmation. Science, 330(6008), 1234-1237. Witte, Shelbie, (2007). 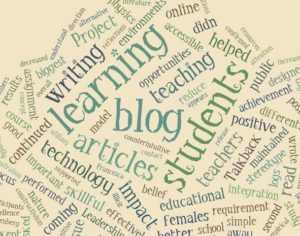 “‘That’s Online Writing, Not Boring School Writing’: Writing with Blogs and the Talkback Project.” Journal of Adolescent & Adult Literacy 51 92–96. This entry was posted in Blog and tagged content literacy, creativity, educational technology, Instruction, research, technology, write2learn, writing. Bookmark the permalink.